Written in English for the purpose of brushing up my English skills. I'd like to make friends with someone who lives in Estonskaya, Latvia, Lithuania and Poland. Frivolous comments aren't welcome on this blog. I'm a member of Matsuyama Century Lions Club. I can play Shakuhachi, a Japanese traditional bamboo flute. I have a license for it. I'm a kind of instructor of it. Whereas I'm not good at other musical instruments. I tried a guitar and a piano before junior high school, but ended up giving them up. I have not been interested in the piano that lies in my living room ever since it came to my house. 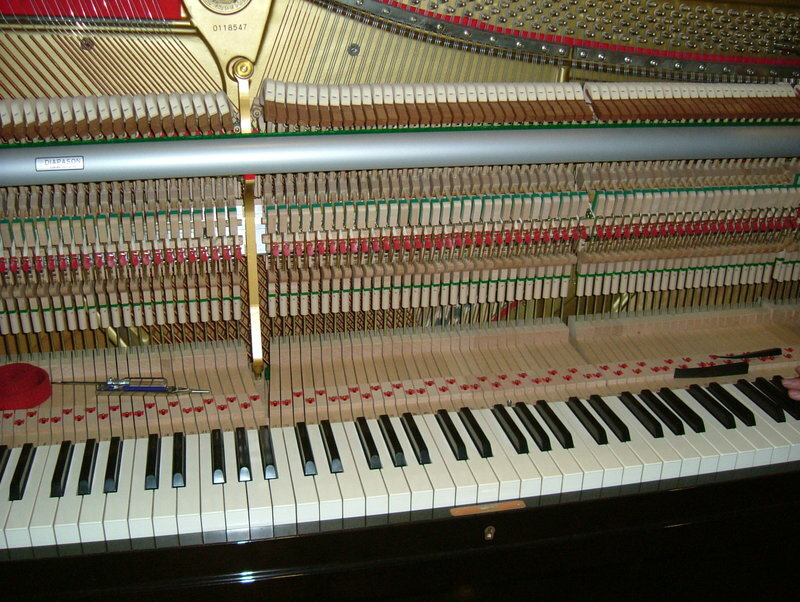 A maintenance man visited and did the tuning of it the other day. 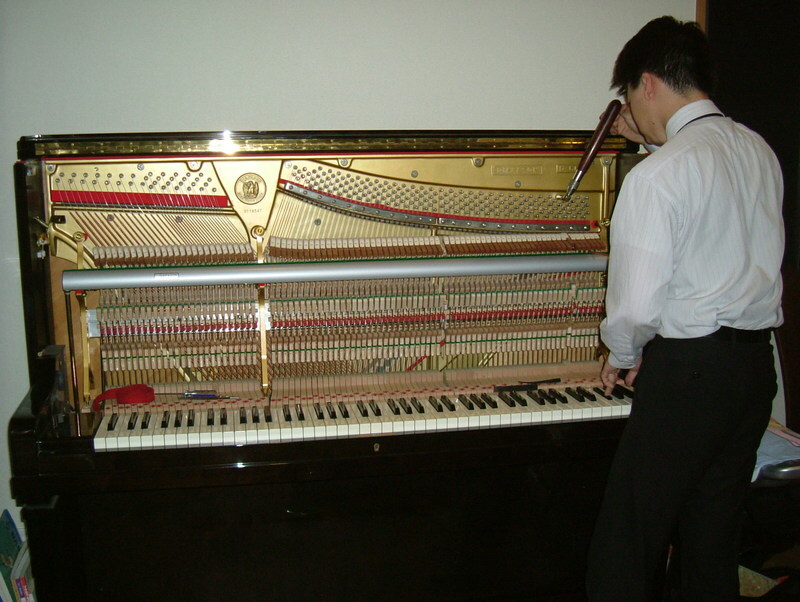 During his checking, I could see the inside of the piano for the first time. At first I felt it beautiful and realized how it works. Wonderful! My old friend, five years younger than me, sent me an e-mail with a picture that I will show you at the end of this entry. He seemed to have bought this motorcycle and enjoys riding every weekend around Mt. Fuji, which is the highest mountain in Japan. We had been working at the same hospital in Osaka twenty some years ago. 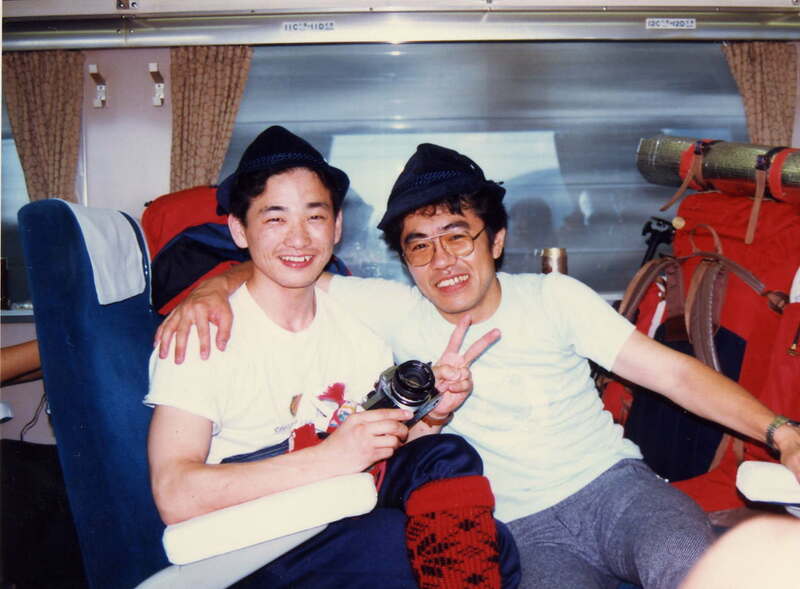 It is him who has a camera in this picture: http://canada1995.web.fc2.com/tateyama/87tateyama-1/original/File0002.jpg He and I were both single and free to go everywhere we wanted. Tons of scenes of my younger days were coming up in my mind. He has two kids now and I have three. I wish we could see each other with our whole families. DCR is a circle of like-minded people who are interested in automobiles. I have belonged to this club for about 20 years. The year-end party of DCR was held on the 22nd and I'm writing about this party this time. We chatted about lots of things that had happened this year and the main topic was Rally Japan 2008 that six of us had joined last month. Several goods from the rally were on the table, which was going to be prizes for some quiz. A few sponsors also offered prizes to the party and our party was gorgeous. 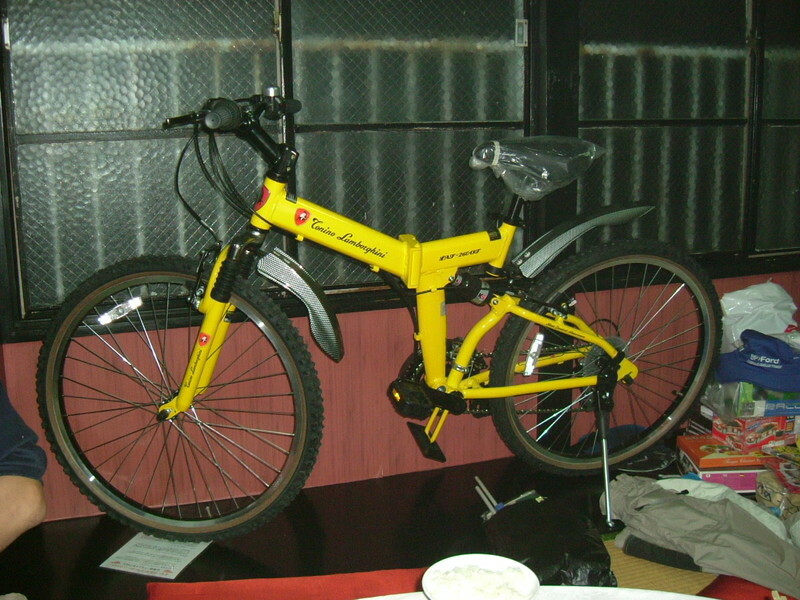 Pictures are of a bicycle from Lamborghini, a radio control car which I won, a mask for a party which was the lowest prize and the scene of the selection meeting. 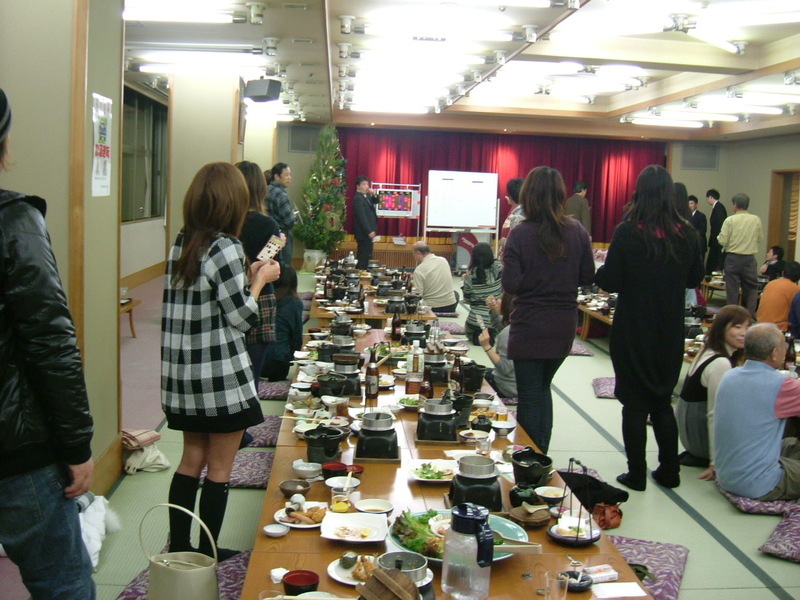 The end of the year party is an annual event in Japan. People from the office, people interested in the same subject, or just friends get together and enjoy eating, drinking and chatting. Fugu has the poison that could kill people and I sometimes hear the news that tells us of an accident when someone died after eating fugu. It is delicious, though. 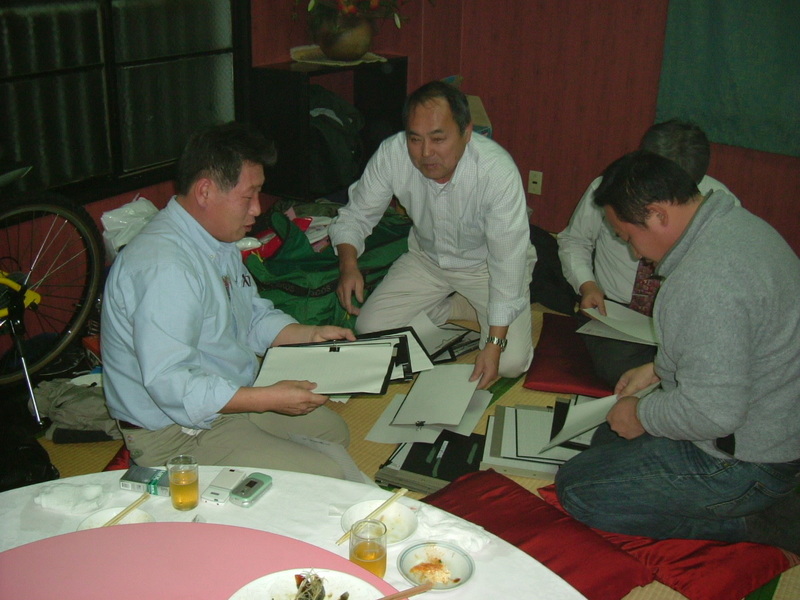 If it was prepared by a qualified and registerd cook, fugu is safe food. I'm reporting on how the cleaning robot worked in a couple of weeks in my house. To make a long story short, it was great! My room has been kept clean all the time. I admire the designer of this robot. How many times or how frequently do you clean your room up? Once a week? As for me, once or twice a DAY! I've only to push the start button. Before taking a bath, if I punched the start button, when I get back the cleaning would be finished completely. It was amazing. I'm thinking of purchasing a second one. By the way, my house is protected with a Secom Security System. The security of every door and window that are wide enough for someone to go through is strengthened. Even if someone successfully managed to get into the house, infrared light would absolutely catch the hot moving bodies. At the same time, the alarm will be sent to the security center and the officers on patrol. So, ordinary thieves never try to break into the house with this system. However, it indicates that Roomba can't move under surveillance. It has a motor to discharge heat, which is easily detected by the monitor and makes officers gather at my house. 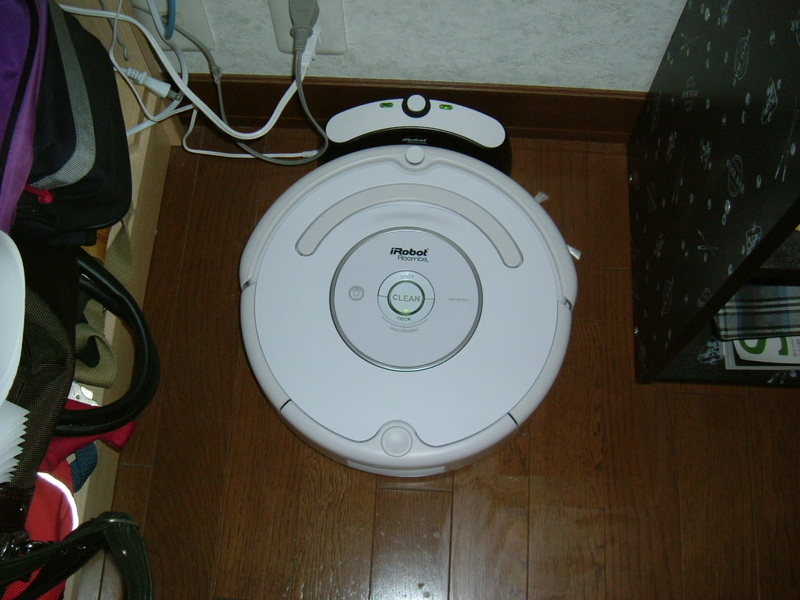 The problem is this; Roomba can't work while the security system is on. The rapid aging of the society and falling birthrates are causing issues on the burden of nursing care of the aged. Some people are obliged to stop working for their parents or someone like that. Some aged people with dementia frequently get lost, or eat anything even if it isn't food. After using cooking utensils, some people never mind the fire of the stove burner. It might lead to a big fire. From the viewpoint of human rights, we are not allowed to peg them down to their beds. Finally, someone has to keep their eyes on them 24/7. In order to overcome these strains, several kinds of assisted-living facilities have been built across the country in the last 10 years. People who find it hard to live in their own home are accommodated into these facilities by the degree of their handicaps. On the other hand, some people don't want to farm their parents out and take care of them in their house. 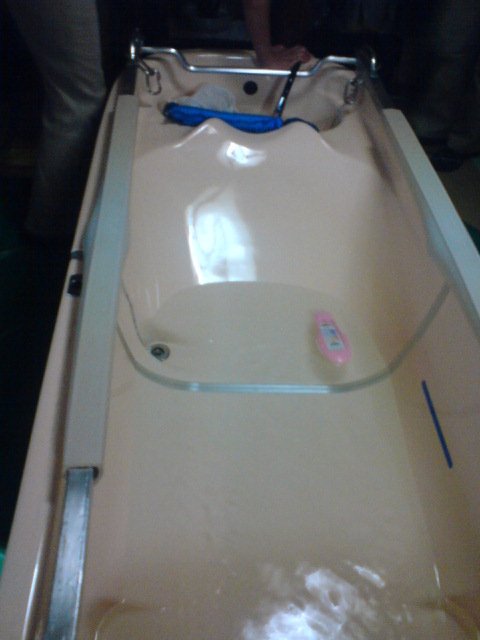 When I made a house visit to one of those patients, I saw a portable bath tub and took pictures. This bath tub consisted of two parts. It was easily built up in front of my eyes. The sealing at the joint was perfect. 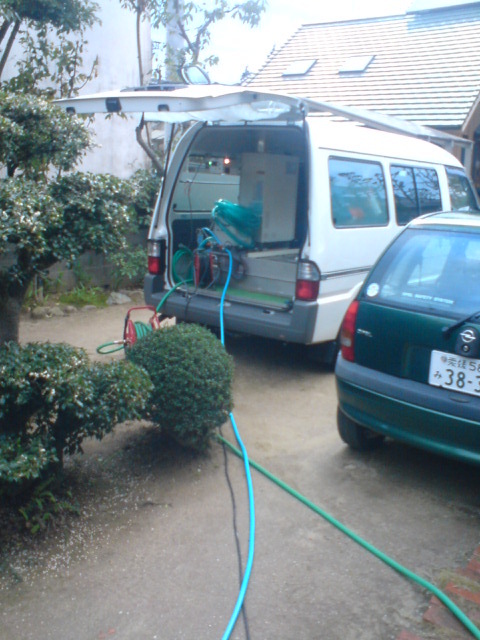 The hot water was boiled in the van as you can see in the last picture and was sent to this tub. 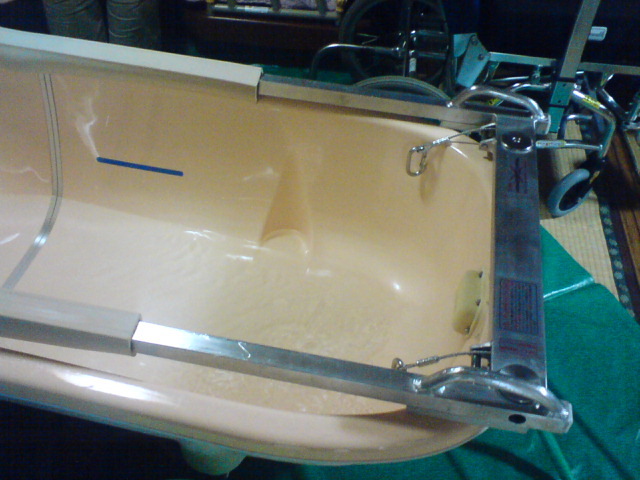 Three care workers help the patient take a bath. These run-of-the-mill services makes me feel that I was lucky to be born in Japan. I heard some shocking news today. 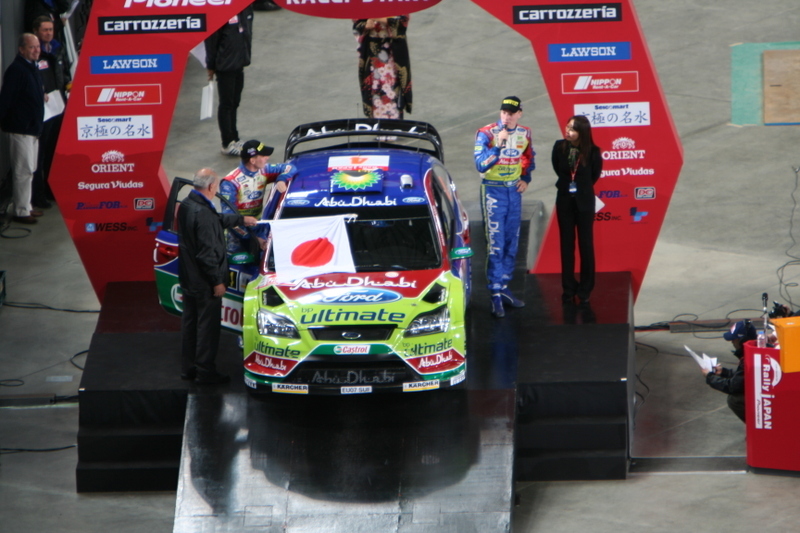 Fuji Heavy Industries Ltd. (Subaru) came to an agonizing decision of their withdrawal from the WRC. 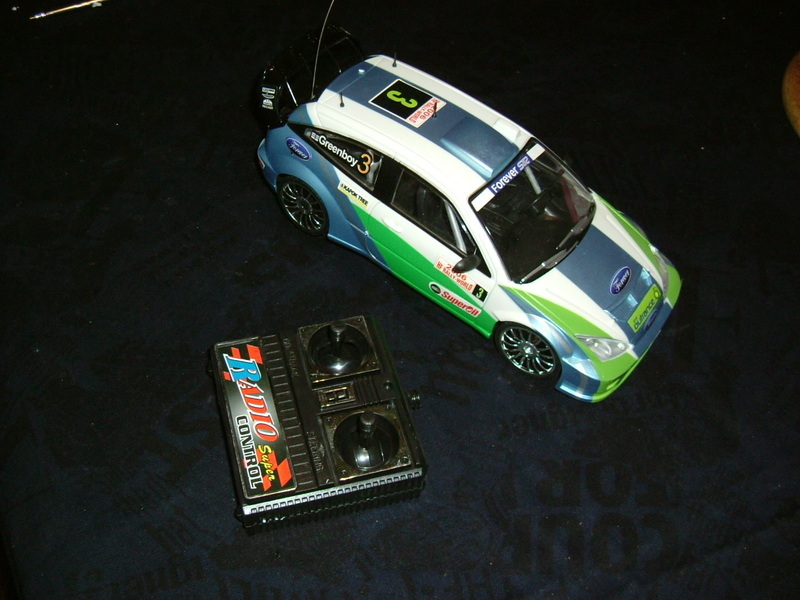 Subaru had joined the WRC for about 20 years and got lots of titles. 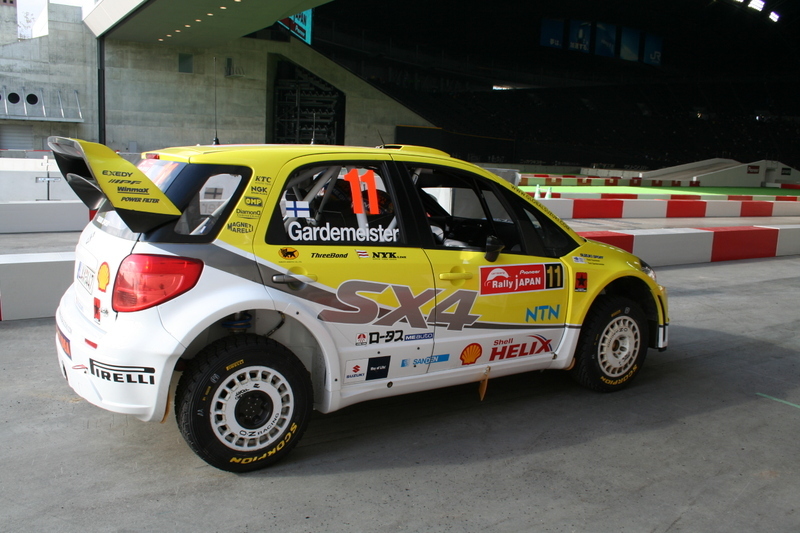 The other day, Suzuki Motor Corporation (Suzuki) announced their retreat from the WRC. Likewise, Honda also determined to stop participating in the F1 Grand Prix. As you can imagine, these firm's policies were due to the economic recession. 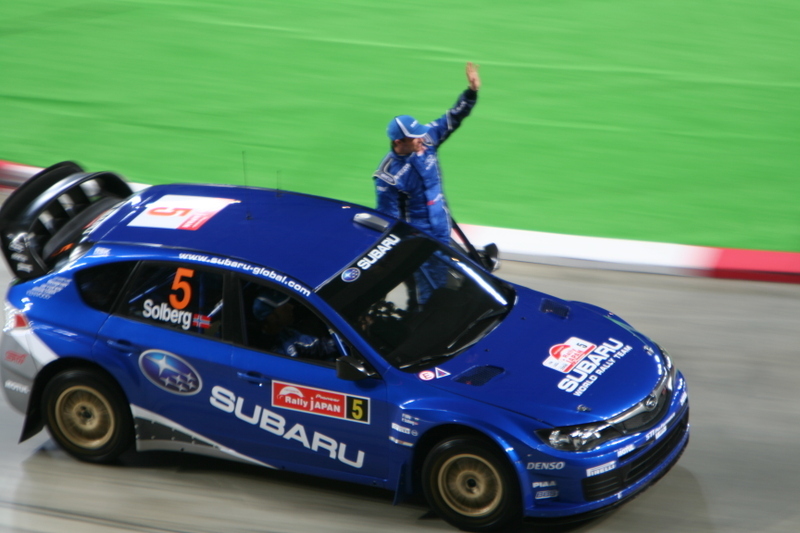 The downturn in the auto industry casts a shadow over the whole motor sports world. Now that you mentioned about the auto industry, what will become of Ford (Ford Motor Co., Ltd.)? 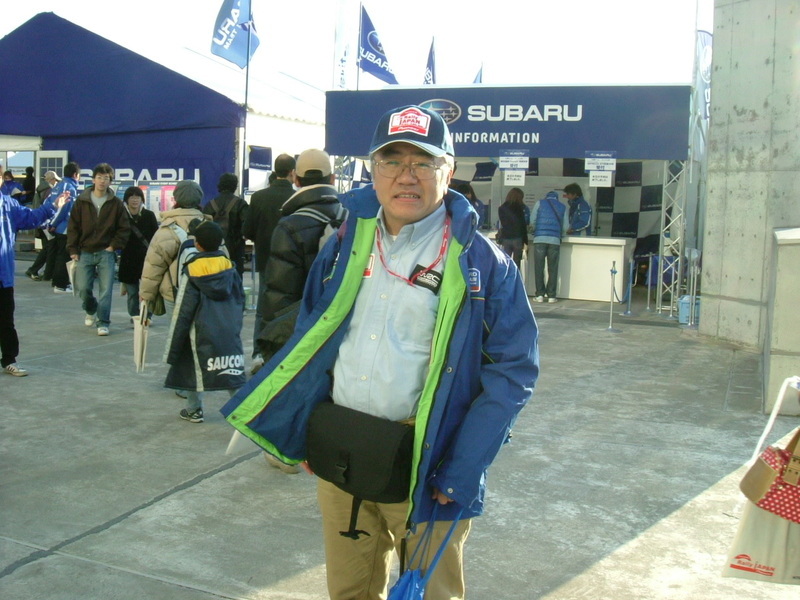 I got a nice jacket at the Ford booth in Rally Japan 2008 last month. It was printed with the logo of the BP Ford Abu Dhabi Rally Team and I wear it almost every day while commuting. My jacket might be kind of out date. I had two riding hands-on lessons today. As I wrote before, I had decided to lift the restriction on my riding license and went through the procedure to enter a driving school two weeks ago. Today was the first day of the practical exercise. At first, I was given a 750cc motorcycle, a Honda CB750 and told to follow the instructor dragging it. Fortunately I could tow it for about 5 minutes and reached a small space. The instructor made the motorcycle lie down gently and ordered me to raise it from both sides. As you can imagine, 750cc motorcycles are heavy and this exercise is a basic item and if I couldn't do it I would be expelled from the school. I was nervous, but I completed this task. The second task was to stop within 8 meters from a speed of 30km/h. I managed to accomplish this task. The last task was a straight narrow course (width 30cm, length 15m, height 5cm). I was required to go through in more than 10 seconds. It was difficult and I have to try again next time. 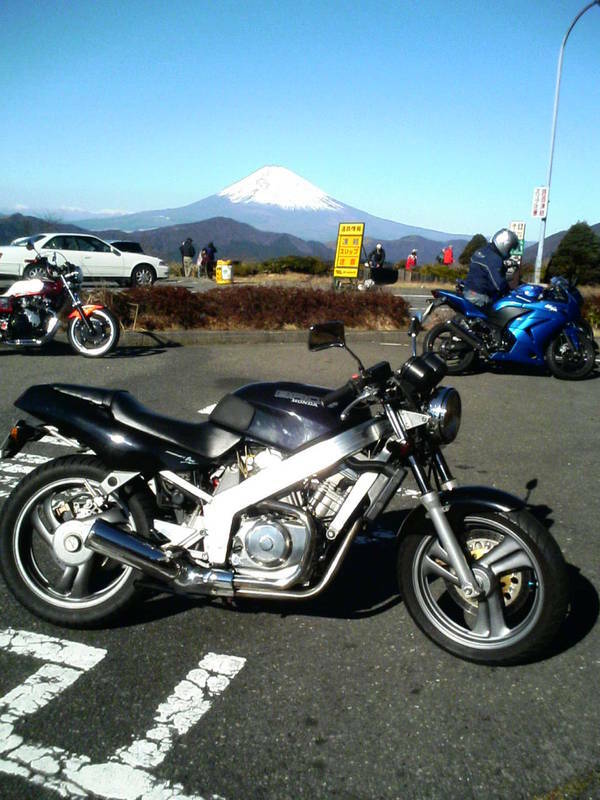 The weather was nice and it was the first time I'd ridden a big motorcycle. I had a great time today. 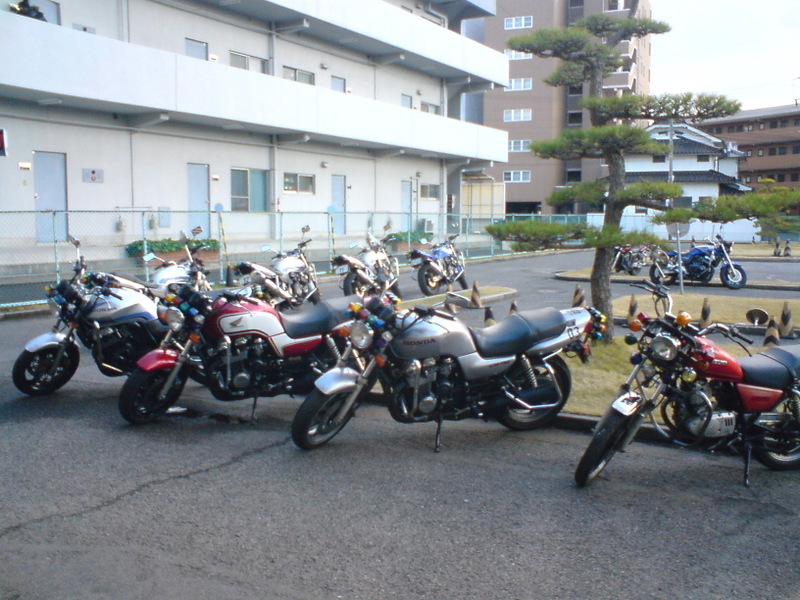 The silver motorcycle in the center of the picture is the motorcycle that I rode today. We are coming up to the end of the year 2008. 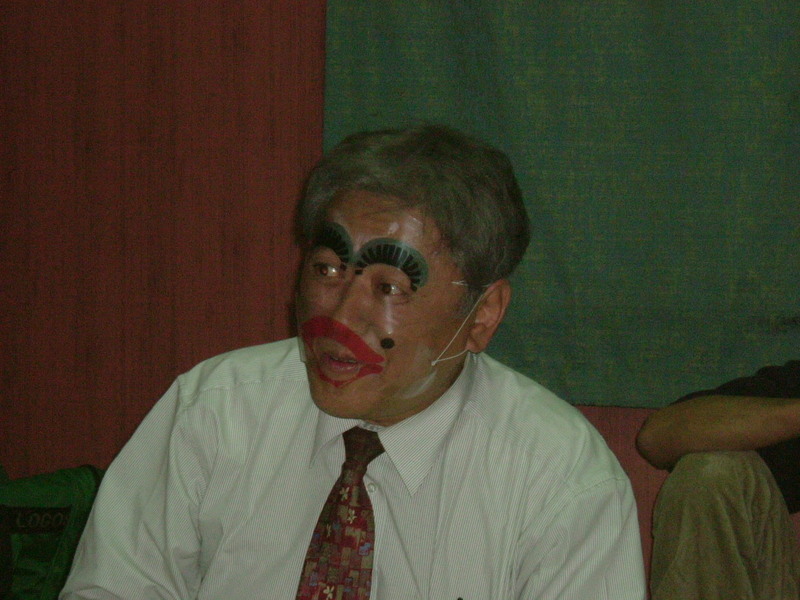 I attended the annual event, the end of the year party, this year too. The picture shows the party. Some people who are standing in the picture were waiting to call their bingos after getting four numbers. I looked for some words about bingo in order to write this entry. When you hit a jackpot, you would shout "Bingo!". Then when you got four numbers in line, how do you express the situation? We, Japanese call "Reach!". Additionally, my dictionary says that the bingo game is one of the gambles and for aged people. It usually is held in Catholic churches or Indian reservations. Is that right? Atomic Bombing by the U.S.